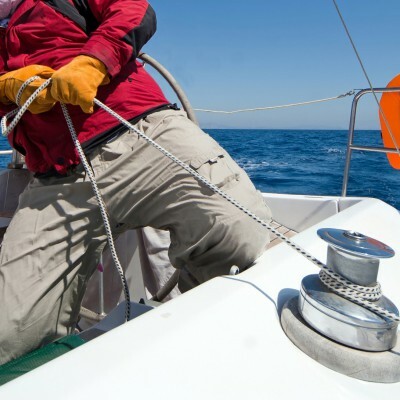 Since communication is one of the crucial elements of a skipper’s job, the question about the skipper’s experience and the very beginnings comes naturally. So I was asked the same question almost every time I took off with a new set of guests aboard a chartered sailing yacht. First of all I have to mention that my connection with sea and sailing comes from my ancestors: my mother’s father was a very known and respected captain, while my mother’s uncle was a passionate sailor who was the co-founder of one of the oldest sailing clubs in the country. I enjoyed spending time at the seaside ever since I was a kid, dreaming about the adventures my grandfather and mum’s uncle lived through their rich lives. During the teenage years I was too occupied with school and other activities so I had no chance of seriously devoting myself to sailing. Finally, I had a chance to visit New Zealand in my twenties, where my Kiwi friends took me on a trip to the Bay of Islands. We rented two Hobie Cats and split into two crews of two and started match racing for fun. I dutifully followed the instructions of my friend and tried to trim the jib the best I could. After a while we decided to change the positions so I had to steer the Cat and trim the mainsail. Surprisingly I did it so well that nobody could believe that it was my first sailing experience. As soon as I got back home to Croatia I decided to take a sailing course at the best sailing school at that time. After a few weeks under the command of my instructor who had the experience of racing Whitbread Round the World Race (Volvo Ocean Race); I noticed that I have loved sailing all my life but I wasn’t aware of it. All subjects in the sailing school and further education for a Yacht Master seemed very simple and self-explanatory so I started to believe that there was some talent sitting in me all these years. Afterwards I joined a sailing team and started gaining my competitive experience as well as skipper’s skills sailing during summer holidays with my friends or doing transfers for charter companies. As time passed I felt like I miss sailing every moment I spent on the mainland. In the meantime I also noticed that I was fed up with my job so I decided to quit it and become a professional skipper and start a career at sea. The situation for such move was pretty favorable because nautical tourism and charter business started to grow that very season. I shall never forget my first skippering weeks when I had to act like an experienced skipper while I was losing loads of sweat doing maneuvers and planning the routes. With years of experience both in charter and at the racecourse I managed to fully embrace this job and am thankful for every moment spent aboard because being a skipper is more than a job. It is a state of mind.